Immigration legislation is stalled in the House, but the public continues to broadly support a path to legalization for undocumented immigrants. At the same time, however, Americans are evenly divided over the growing number of undocumented immigrants who have been deported from the U.S. in recent years, with as many viewing this as a good thing as a bad thing (45% each). The total number of deportations reached a record number of 419,384 in fiscal year 2012, according to the Department of Homeland Security. With roughly three years left in Barack Obama’s second term, more than 1.6 million undocumented immigrants have been deported since he took office. In former President Bush’s eight years in office, two million were deported. While opinion about the growing number of deportations is divided along partisan lines – with Republicans more supportive of the practice than Democrats – there also are sizable differences between Hispanics and whites. By 60% to 35%, most Hispanics view the increased number of deportations negatively, while whites are more likely to see this trend as a good thing (49%) rather than bad (42%). A survey conducted last fall by the Pew Research Center’s Hispanic Trends Project found widespread concern over the threat of deportation among Hispanics. In fact, a majority of Hispanics (55%) said it was more important for undocumented immigrants to be able to work and live in the U.S. without the threat of deportation than to obtain a pathway to citizenship. About three quarters of the nation’s 11.7 million undocumented immigrants are Hispanic, according to Pew Research Center estimates. The new national survey by the Pew Research Center, conducted Feb. 14-23 among 1,821 adults, finds little change in overall opinion about immigration legislation since last May. Nearly three-quarters of Americans (73%) say there should be a way for people in the United States illegally to remain in this country if they meet certain requirements, while just 24% oppose this. 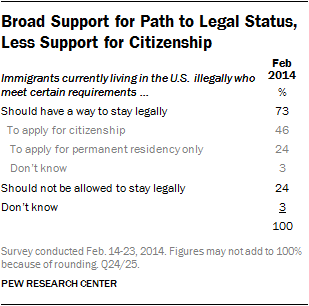 But fewer than half (46%) believe that those who are in the U.S. illegally should be allowed to apply for citizenship. There also has been little overall change in opinions about the importance of passing new immigration legislation. About half (49%) say the passage of new immigration legislation is extremely or very important, while 26% view this as somewhat important and 21% say it is not too important or not at all important. However, the goal of enacting immigration legislation has taken on greater importance among Democrats – particularly liberal Democrats. Currently, 60% of Democrats say it is extremely or very important to pass new immigration legislation this year, up from 53% last June. But among liberal Democrats, 66% see this goal as highly important, compared with 53% who said this in June 2013. By contrast, there has been little change in the shares of moderate and conservative Democrats (currently, 54% extremely/very important) — or independents or Republicans — who view this as a major goal. 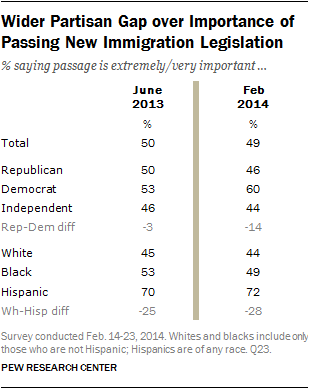 Hispanics continue to view the passage of an immigration bill as more important than do either whites or blacks. Fully 72% of Hispanics say it is extremely or very important that the president and Congress pass new immigration legislation, compared with 44% of whites and 49% of blacks. A majority of Republicans (55%) views the growing number of deportations of undocumented immigrants in recent years as a good thing, while nearly as many Democrats (53%) express a negative view of this trend. Independents are divided (46% good thing/43% bad thing). 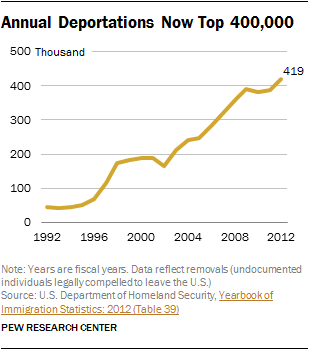 Tea Party Republicans have an especially positive view of the rising number of deportations. Nearly two-thirds of Republicans and Republican leaners who agree with the tea Party (65%) say the increase in deportations of unauthorized immigrants is a good thing, compared with about half (52%) of non-Tea Party Republicans. While there also are partisan differences over how to deal with those in the U.S. illegally, majorities across partisan and ideological groups say there should be a way for unauthorized immigrants to stay in the U.S. if they meet certain requirements. Yet there is far less support for allowing those in the U.S. illegally to apply for citizenship. Among ideological groups, liberal Democrats are the only one in which a majority (66%) favors allowing those in the U.S. illegally to apply for citizenship. 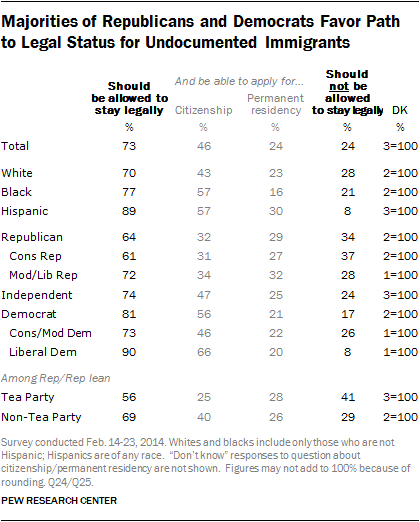 Republicans generally favor finding a way to allow unauthorized immigrants to stay in the U.S. legally (64%), including a majority of Republicans and Republican leaners who agree with the tea Party (56%). But just 32% of Republicans overall and a quarter of Tea Party Republicans (25%) want those here illegally to be able to apply for citizenship.